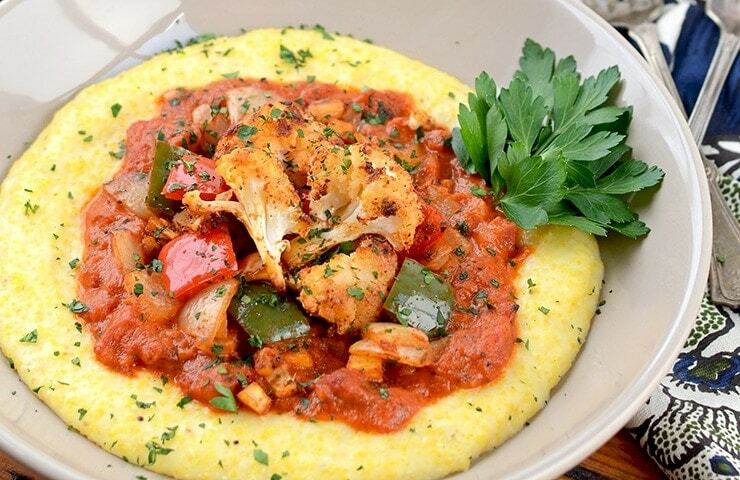 Get a taste of Lowcountry cuisine with this vegetarian take on Shrimp and Grits. 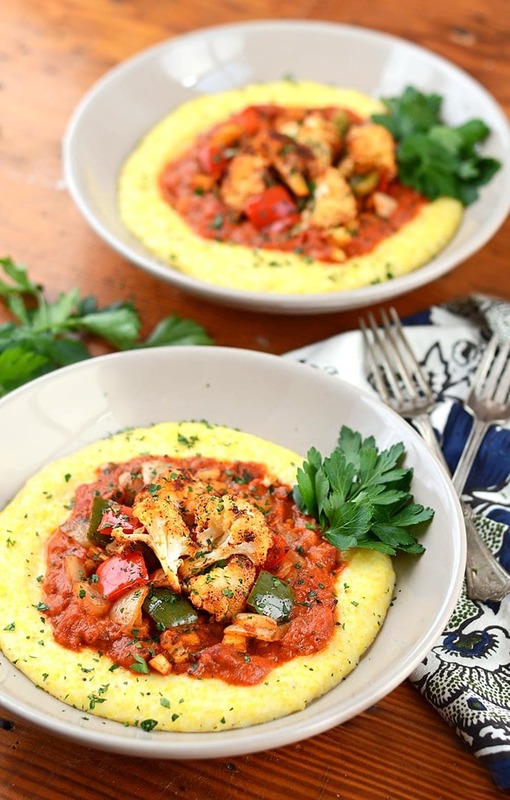 Our recipe for Cajun Roasted Vegetables with Cheesy Grits has all the warm, hearty flavors of South Carolina’s coastal cuisine with a twist. 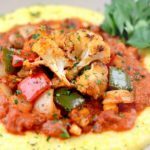 Creamy grits and a rich tomato gravy accompany Cajun spiced cauliflower, peppers, parsnips and onions for a delicious meal. In January, Kevin and I took a winter vacation to Charleston, South Carolina. We figured that heading south from West Virginia to a coastal climate would be nice break from the frigid cold of home. However, usually temperate Charleston got a cold snap just in time for our arrival! I’m not a fan of the cold, so in many ways it was pure misery. But we persevered enough to see many of the area’s famous stops. 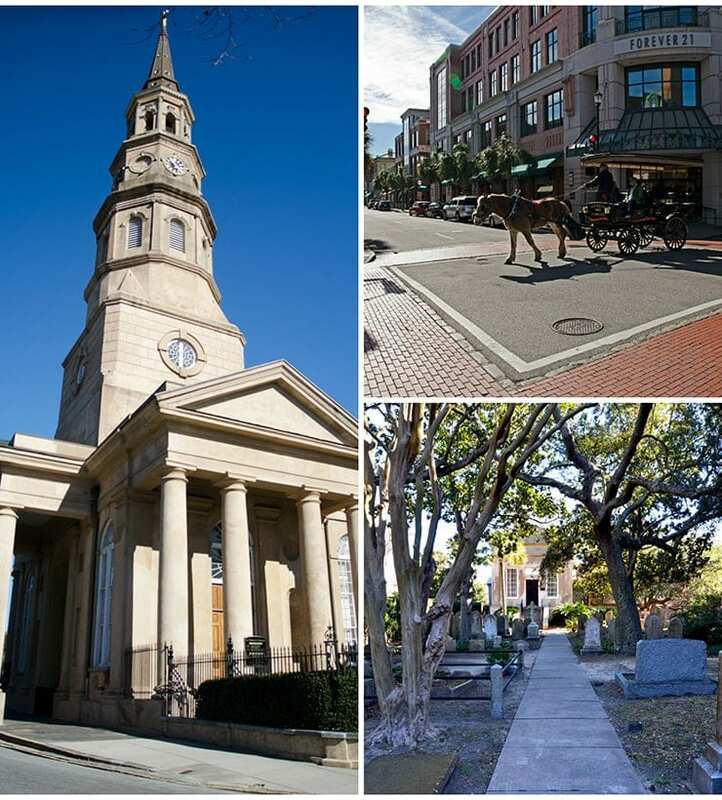 We shopped the City Market and the Upper King Street District, did some letterboxing in the area of St Phillips Church and even had drinks on the rooftop bar of our hotel, The Vendue. Who needs to feel their fingers and toes on vacation? Not us! We even managed to visit THREE National Parks despite the bitter temperatures! I mean we had to get our NPS passport stamped! Despite the wind whipping us about, we braved the elements at Fort Moultrie on nearby Sullivan’s Island. 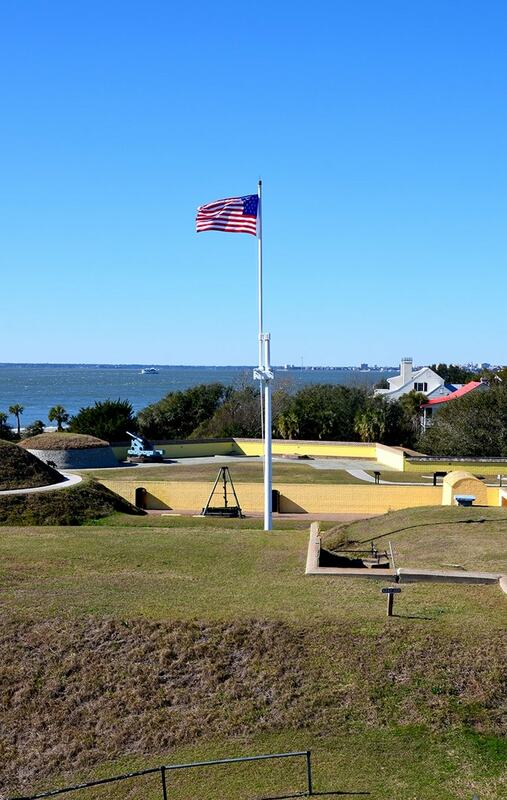 With a history spanning from the Revolutionary War to 1960, the park has fortifications from many different military eras. For a winter day, this park was an ideal visit because there are plenty of indoor exhibits to make the weather bearable. The most interesting was a WWII communications bunker with vintage desks, posters and office equipment. It’s a virtual time capsule so complete, you almost expect to see an officer round the corner with his cup of coffee! The most amusing indoor activity was the visitors center movie. Let’s just say that the film is a piece of history in and of itself! One actor takes you through the eras of Fort Moultrie playing various characters through time. The script is schmaltzy and the accents are horrible, but the pornstache of actor Micheal Longfield is EPIC! Outside, a self-guided tour of the fort is an informative walk through advancements in fort construction techniques. Its also an ideal location to get in your steps, as there are many indoor bunkers below ground and lots of land to cover. Not far from Fort Moultrie is the Charles Pinckney National Historic Site. Here on Snee Farm, you can learn about one of the fathers of the US Constitution and four-term South Carolina governor Charles Pinckney. This is a nice stop for history lovers, especially those who like to learn about nearly forgotten founders of the American political system. But unlike Alexander Hamilton, you are unlikely to find Pinckney a figure worthy of rediscovery. His controversial opposition to the Missouri Compromise is in part what doomed this prominent politician to historical obscurity. A trip through Snee Farm’s 28 acres is a pleasant outdoor activity. 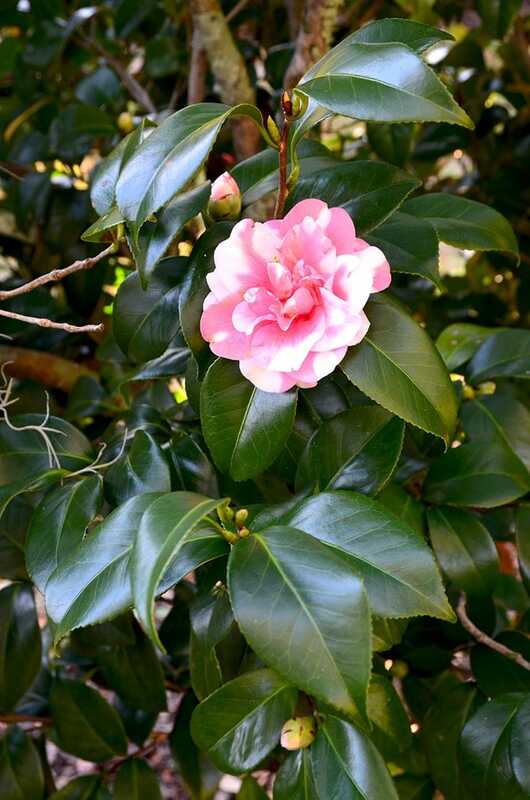 Even with the cold, the roses were in bloom and live oaks covered with Spanish moss dotted the landscape. But as far as history goes, little is left to remind us of the working plantation of Charles Pinckney. Given his pro-slavery stance, this might be for the best. Our third NPS stop was the famous Fort Sumter. You know, THE Fort Sumter where the first shots of the Civil War were fired. Located on an island in Charleston Harbor, it is only accessible by boat, so on another blustery day we boarded a ferry for a tour (a three hour tour). I’ve been to many amazing forts, such as El Morro and Castillo de San Cristobal in Old San Juan; Fort Monroe National Monument in Virginia Beach; and Fort Adams State Park in Rhode Island. They usually have one thing in common…lots of walls! But Fort Sumter is different because so much of it was destroyed during the Civil War. Rather than rebuilding, for years the fortress laid in ruins. Then as the Spanish American War intensified, new concrete fortifications were built inside the old fort. So a tour of Fort Sumter requires imagination to picture it as how it would have been. If this is not your forte, there is a model replica in the museum area (which is heated!). But a stroll outside offers water views, many canons to inspect and if you’re there for the last tour of the day, you can participate in the flag ceremony. 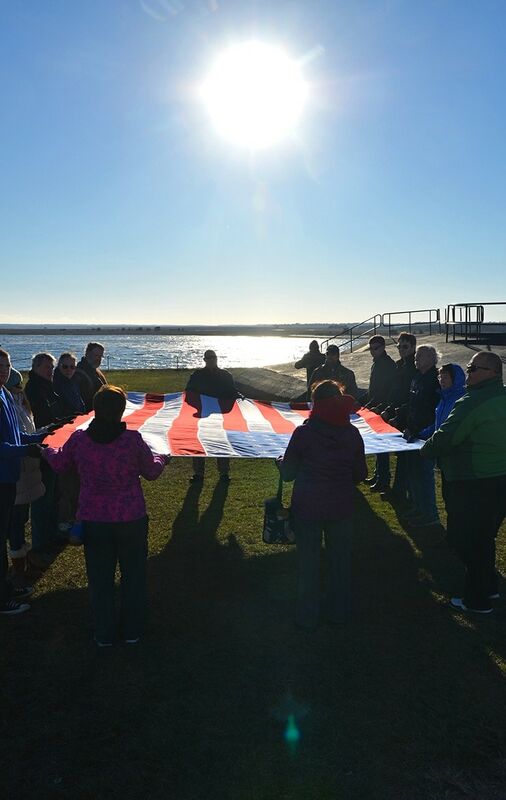 Because it was windy, it was all hands on deck to take down and fold the stars and stripes, a task all of the participants attended to with care. Did I mention it was super cold? How did we get through it? 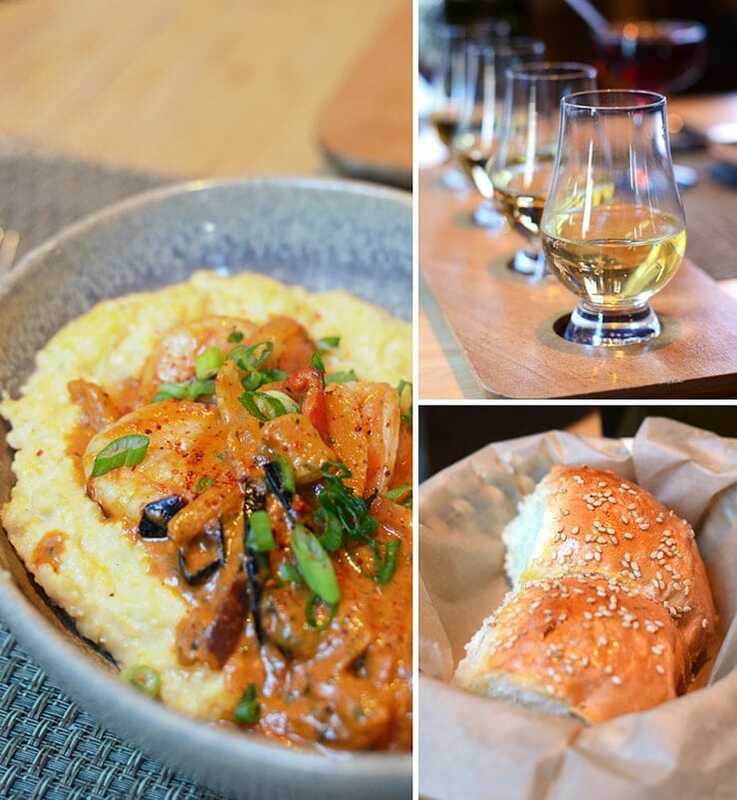 Charleston Restaurant Week! We had the pleasure of going to lots of great restaurants that would otherwise have been too expensive to enjoy so many. Among our favorites were Le Farfalle (Italian with housemade pasta), Circa 1886 (upscale fusion) and Husk (fancy Farm to Table). I’m not very knowledgeable about Lowcountry cuisine, but I am a huge fan of shrimp and grits. I was very pleased with the version at Husk. The grits were super creamy, the shrimp were tender and the spice level was perfectly balanced. Extra bonus because Husk had traditional cider flight to wash it down with! When I got home I thought I’d give the dish a try. But I thought I’d give it a twist by making a vegetarian version. Meat eaters are probably groaning, but don’t knock it until you try it! Shrimp has a subtle, sweet flavor, so I decided that the best replacement would be parsnips and cauliflower. Not only are they white like shrimp, these two veggies also have a natural sweetness. For balance, I also included onions and red and green bell pepper. Together, the veggies are tossed in a Cajun seasoning and oven roasted sheet pan style. Now as amazing as these Cajun veggies taste alone, they get paired with stone-ground cheesy grits and a tomato gravy. The grits are soft and creamy thanks to milk and cheddar cheese…well that and frequent stirring, which I’ve heard is the secret to soft grits. The tomato sauce is a simple combo of sautéd garlic, Cajun spice, tomatoes and cream which is reduced to a thick gravy. Everything is made from scratch and you can do it in about an hour. I love this Cajun Roasted Vegetables with Cheesy Grits recipe! It transports me back to the Lowcountry with the sights and smells of this unique cuisine. Hopefully next time I visit Charleston the weather will be warmer. There’s so much more to explore and eat! This recipe is a vegetarian twist on the traditional Lowcountry dish Shrimp and Grits. In a large pot, combine water, milk, butter and salt and bring to a gentle boil. Add in grits, stir and reduce heat to a simmer. Stirring frequently, cook grits until they are tender. If need be, add more water to keep them creamy. Once grits are cooked, turn off the heat, and slowly add in grated cheddar. In a wide sauce pan, heat oil over medium heat. Once the oil is hot, saute the garlic until golden. Add in the spice, tomatoes, water and cream and bring to a boil. Stirring often, cook the sauce until the tomatoes have broken down and the sauce has thickened. Preheat oven to 425F and line a sheet pan with foil. Combine oil and Cajun seasoning in small bowl or pitcher. One at a time, mix each vegetable in a bowl with a little of the spice and oil mixture. Place the vegetables on the prepared sheet pan, but don't mix the veggies together. Sprinkle all the veggies with salt. Bake until veggies are tender but still crisp. In my oven, onions took 7 minutes, peppers 12 and the parsnips and cauliflower took about 20 minutes. As each get done, remove them to a heatproof bowl and cover. Spoon grits into the bottom of a shallow bowl, making a well in the center. Ladle the tomato gravy onto the center of the grits. Top with roasted veggies and garnish with parsley or scallions if desired. To save time, start your grits and tomato gravy first. While those are cooking, chop your veggies. I used Legion Cajun Seasoning and absolutely loved the flavor. Beware lower quality seasonings that are full of fillers like sugar. I brought back Geechie Boy Grits from Charleston but you can use any kind you like as long as they are not instant grits. 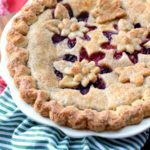 Not only is this mixed berry pie tender, flaky, and fruity, it is also beautiful. Learn how to make this pie from scratch using simple ingredients and cookie cutters. 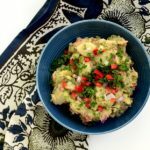 Take your picnic from boring to wow with this Colorful Potato Salad recipe. Fresh veggies, herbs and spices make this salad pop. Lemon Icebox Pie is sweet, tart, creamy, nutty and best served cold! This mouthwatering icebox pie hits the spot when the thermometer soars! This is absolutely gorgeous! And so creative to use veggies on top of those luscious grits! 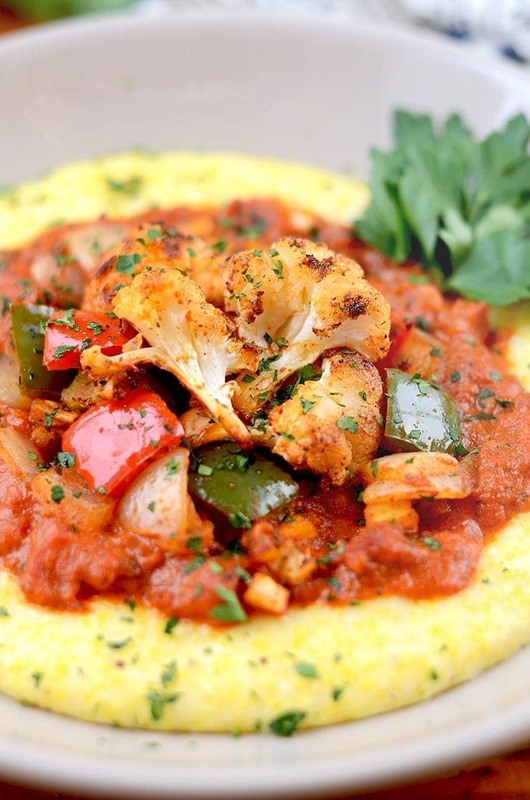 Love this vegetarian version of shrimp and grits! Yum! Cheesy grits. I like the idea of roasted veggies with Cajun flavoring. Very hearty!